What is the human experience? Is it defined by our everyday interactions with one another and our external environment? Or is it characterized by our seemingly unique abilities to empathize? Our ‘free will’? Virtual reality, along with every other (insert adjective here)-reality tech, has given compelling responses to these questions, further blurring the line of what differentiates the human experience to everything else. 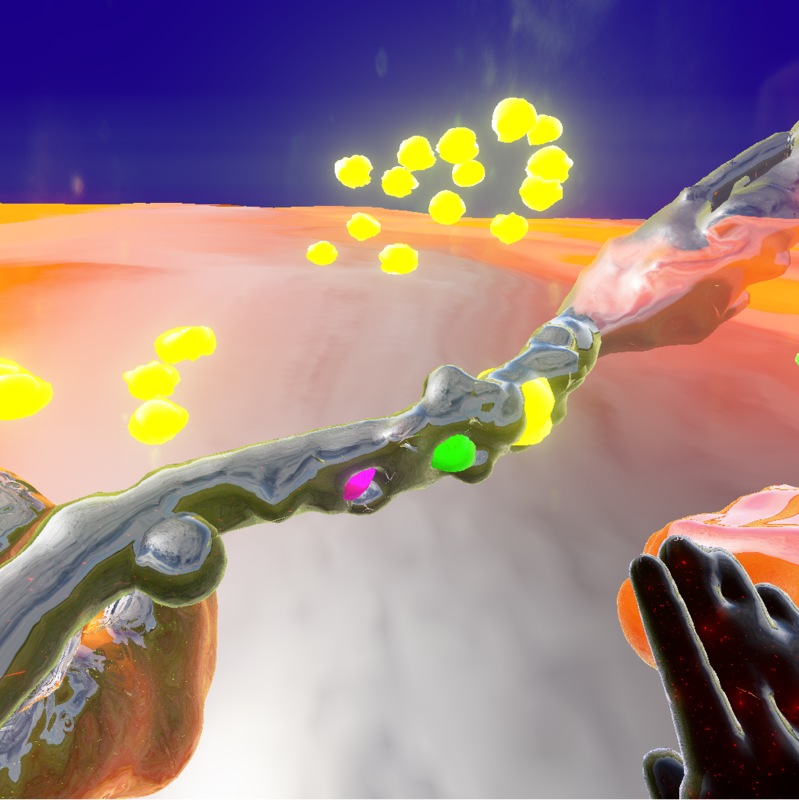 A curious project that is still in development, Wump VR is what most would describe as a psychedelic trip that peaked a bit more than it should. Mesmerizing visuals and musical interactions bombard your senses as users try to figure out how to navigate through this vivid Cronenberg version of the human experience. Wump VR simplifies and transforms the human experience into what might as well be an alien dream. Each life state is defined by the visual aesthetics and interactions the user encounters as they progress through the experience. The user’s body changes and morphs through each stage, granting new modes of interaction with the environment. There are many virtual reality developers and creators with their own unique aesthetic stories to tell. Soon, we’ll be living in a future where we can choose any experience we want to live, temporarily or even permanently. I believe the human experience is not inherently human but rather an extension of the fluidity of existence. Are we all living a vivid virtual dream, wandering around as we all soak in the abstract information of our environment? Do we even want to take off the goggles? That’s for the individual to decide. Vladimir Storm and alpha_rats are incredible VR designers. More of their beautiful work can be found on their Behance. As incredulous as it may seem, I have had numerous people ask me why I support research and funding for reversing the aging process. In this short article, I would like to present my personal views on aging and why I believe it is perfectly natural, and in fact, desirable, for human beings to want to overcome this limitation, or at least, slow it down. We humans have a very peculiar relationship with aging and death. On the one hand, people spend rather large sums of money on products or services that help them look and feel younger and healthier. In essence, what these people are communicating through their spending habits is that they have a desire to slow down the aging process. Yet any talk of actually reversing the aging process is met with puzzled looks or even dismissal by the very same people. On the other hand, most people dread the condition of death but have resigned themselves to the idea that there is nothing we can do about it. So while we tend to believe that death is unavoidable, we somehow also think that it won’t happen to us for a while longer, and so we put these very important topics on the back burner and refuse to think further about them or consider how to overcome them. My personal viewpoint is that nothing gets solved without there being some sort of action toward solving it. Problems do not normally resolve themselves. To those who ask why we should spend money, time, and effort on reversing aging, I shall present three reasons why I believe it is beneficial for us to do so. Firstly, human beings have always wanted to improve, to grow, and to overcome hardships and challenges. Saying that there is some natural order of things is not a valid argument against reversing the aging process. Imagine if we had, in the past, accepted a shortened lifespan as the natural order of things. It’s good that we didn’t, because global average life expectancy has more than doubled since the year 1900. Imagine if we had, in the past, accepted a chaotic, uncomfortable, and dangerous life as the natural order of things. It’s good that we didn’t, because we came up with inventions such as electricity, the Internet, the X-ray, indoor plumbing, heating, and so forth. Imagine if we had, in the past, accepted our young sons and daughters having their precious lives cut short by illness as the natural order of things. It’s good that we didn’t, because we now have cures for dysentery, malaria, and tuberculosis. The fact is that the human condition involves us progressing, overcoming limitations, and being better human beings. Hence, it is natural for human beings to want to overcome undesirable situations, and I would imagine that most people would state that poverty, disease, and aging are undesirable. Next, reversing the process of aging will give each one of us additional time that we need in order to accomplish other lofty goals. Imagine if you had an additional 10 or 20 young years of life. How much more could you accomplish during that time? We could spend more time on goals such as eliminating poverty, coming up with a cure for cancer, working toward world peace, and so forth. I find it hard to imagine that someone could argue against having more time in life to work on their personal purpose, vision, and mission. Therefore, reversing the process of aging would result in us being able to work on other things that are important to the human race, thereby creating a virtuous cycle of improvement and progress. Finally, perhaps the most beautiful aspect of the human condition is having a human experience. The human experience includes things such as building relationships with other people, enjoying the splendors of a warm summer afternoon with friends or family, and partaking in any number of stimulating and rewarding activities, such as reading, exercising, and doing charity work. To those of you who are in a romantic relationship, I ask, wouldn’t you want more time and more opportunities to be with your spouse or partner? Imagine never hearing your partner whisper sweetly in your ear again, or forever losing the overwhelming pleasure of making love to them, or no longer experiencing the rewarding growth you’ve experienced with them since you became a couple. To those of you who are actively involved in an ambitious project or important cause that means a lot to you, I ask, wouldn’t you want more time and more energy to work on these things that are meaningful to you? Imagine never being able to work on fulfilling your purpose or vision in life. There are many more reasons why I believe we should focus on reversing aging, but the three reasons above are a good starting point for us to more seriously consider this most important of issues. Let’s even assume for a moment that implausible scenarios such as reincarnation and life after death are real. Why wouldn’t we want to live this current life better? I do not believe it is mutually exclusive to believe in life after death and also want to live our current lives better. Throwing up our hands in defeat and accepting things as they currently are does not lead to progress and growth; it leads to atrophy. So before we give up the good fight and resign ourselves to an old and decrepit future, we must ask ourselves what we are living for. If I had to give just one reason for wanting to reverse aging, it would be pretty simple: I love life too damn much. Filmmaker Duarte Baltazar of Utopian Focus has made available the “I Am Transhuman” T-Shirt for sale on Amazon.com, in an effort to fund the creation of further documentary films about the transhumanist movement. (See an example of a short film by Mr. Baltazar, “The Hedonistic Imperative“.) The U.S. Transhumanist Party offers this announcement to its members as another possibility for raising public awareness of transhumanism as well as spreading the expression and hashtag #IAmTranshuman, part of the Transhuman Present project. Order the “I Am Transhuman” T-Shirt on Amazon here for the price of $19.99. Various male, female, and child sizes are available. I am probably not the ideal Transhumanist; I do believe that I have a soul, that it is more the essence of me than the sum of my neurons and how they interact with each other to create my thoughts, and that it is an extremely fragile thing. Should I die and preserve myself to be revived at a later date, I fear that I would never know of the success or failure of that endeavor. That a living breathing thinking person who acts like me and reasons like me will rejoin society is not in question; I only wonder that I might miss it as my essence passes on into some other form of existence… or worse – not. I do not believe that a digital substrate will, in fact, carry my soul on uninterrupted. I want to explore the question of the soul for a moment. In The Singularity is Near (2005), Ray Kurzweil stated that the Calculations Per Second of the human brain are in the vicinity of 10 to the 14th power, based on the assumption, and rightly so, that each neuron in the brain could be considered a digital on/off or 1/0. Around six years ago, we began seeing articles describing microtubules in the axons of the neuronal cells that seemed to have quantum properties I freely admit to not understanding. I cheerfully invite anyone to correct me on this, but it seems that while the neuron either fires or doesn’t as it communicates with the neighboring cell, the microtubule seems to exist in a sort Schrödinger-like state of possibilities – like a multiplexing wire that might convey one piece of information by doing so at a particular combination of wattage, voltage, and resistance, then convey a completely different set of instructions with another combination of the same. It seems to me that if every neuron is operating in a digital on/off state, then 1014 computations per second (CPS) are likely given the average number of neuronal cells in the human brain, and if that number might be horribly wrong because of what we now know of the activity within the axon – then this suggests that superposition state of neural activity might very well be the essence of our consciousness and, if interrupted, could be lost and what remains would be something else only a comfort to those we would have left behind. I agree that an entirely biological existence is not only a seriously limiting factor in our future development, but also something we are destined to outgrow and will do so. However, I would say that my ideal manifestation of this is a seamless combination of man and machine. Medical technology could eliminate all the senescence we suffer to the point where the next logical step is enhancement over a timeless organic form. I, for one, would hate to live for hundreds of years and gather all the knowledge and experience of those times only to die because of some future equivalent of a drunk driver. That in itself is good enough reason to fortify my existence any way I can. If that means that my body must be replaced with an artificial one, so be it. But, I want to keep my squishy, limited, fragile brain! I want my cake and to eat it, gleefully, with a nearly indestructible form that doesn’t need the cake, won’t get fat from it, and still let’s me enjoy the flavors and textures as I do now. I want to enjoy all the many hedonistic joys freely and with only greater precision than my limited biological form can experience. I believe we’re seeing this very trend emerge and that the collective instinct of man is far more ready to accept an enhanced human/cyborg than uploading oneself to a purely artificial substrate. Evidence of this can be seen in the amazing promise of Elon Musk’s Neuralink project, the recent X-Prize challenge for a robot avatar, and the many amazing advancements in prosthetic limbs and organs. As I previously stated, medical technology will soon overcome senescence, allowing our tissues to go on indefinitely, so to essentially cure our brain of degeneration, enhance it with a neural mesh, and go about our lives in a perfected cybernetic body akin to Ghost in the Shell: Altered Architecture is probably a pretty good direction to be steering ourselves as Transhumanists. It’s also the most likely Next Step, if you will, considering how well society is conditioned for these themes. I would certainly feel more comfortable with my own enhanced mind in a perfect and durable body that can be easily upgraded and modified as the centuries pass. So now I ask the members of this community to bring their thoughts here. What is your ideal existence? Commentary by Gennady Stolyarov II, Chairman, United States Transhumanist Party: “Squeak” is a print by Dr. Laura Katrin Weston, a.k.a. Katrin Brunier, the original exemplar of which I received in November 2017 due to my donation to the successful MouseAge crowdfunding campaign by Lifespan.io. There is an idea or perception bandied about the general public that unstoppable technological forces are already upon us like a runaway train, threatening to derail our way of life and everything we have ever known, and that there is nothing we can do about it. However, I would like to offer some hope and at the same time dispel this seemingly apocalyptic scenario. There appear to be two main schools of thought when we discuss the future; the Ray Kurzweil school of thought, which states that the future will evolve as it will and that we will reach Singularity by a certain date, and the Peter Thiel school of thought, which says that the future won’t be built unless we build it. I would like to add upon Mr. Thiel’s idea by saying that the future will indeed be built, but unless we, as a society, a human race, and a world, join forces to build a future we would like to live in and which reflects our values, we will indeed have a future, but perhaps not one we are completely comfortable with. Thus, this is a call to action for not only those who are actively involved in the fields of technology, science, and engineering, but all people around the world, because the sum of our collective actions will decide the fate of the world, and the future we live in. Whether we want to admit it, all of us are, on some level, responsible for how the world develops every day. I urge those of you who may have resigned yourselves to the idea that there is nothing you can do to help change the trajectory of the world to take a look with new eyes. There is always something all of us can do, because every day we are interacting with others, building relationships, helping to create products, working on resolving problems that affect humanity, contributing to the success of an organization, company, or family, and performing actions that help the world develop, no matter on how small a scale that might be. Everyone on Earth has a role to play in the creation of our future. That is what you are here for – to help fulfill your personal vision and mission while also contributing to the development of the world. That is how important you are. So the next time someone remarks that the writing is on the wall and that we should just accept that we have no say in how the world evolves, please remember that we are all architects of our own future, which hasn’t even been written yet. How it will be written depends on the actions every one of us takes every day. Therefore, the question we should be asking ourselves every day is, what kind of future will we build? And then, of course, after answering this question, we should not waste any time in building that future we have envisioned. Commentary by Gennady Stolyarov II, Chairman of the United States Transhumanist Party: “Teeming” is a print by Dr. Laura Katrin Weston, a.k.a. Katrin Brunier, the original exemplar which I received in November 2017 due to my donation to the successful MouseAge crowdfunding campaign by Lifespan.io. Although some may consider the plants depicted in this print to be weeds, Laura Katrin Weston has painted their flowers beautifully. Such plants proliferate in a teeming, but ultimately ephemeral manner – yet this print presents a view that can be enjoyed indefinitely, in effect taming the weeds and presenting their best imagined attributes for our appreciation. While the United States Transhumanist Party cannot endorse any candidate running for any other political party, we can offer congratulations, in our role as political observers, to an individual whose campaign for Governor of California has offered additional exposure for transhumanist ideas. On Tuesday, June 5, 2018, Zoltan Istvan will be on the ballot in California as one of two candidates endorsed by the Libertarian Party of California. While he is not running as a Transhumanist, he is nonetheless a (small “t”) transhumanist running as a Libertarian, and as we are interested in seeing transhumanism become a ubiquitous political presence (such that politicians of all party affiliations become comfortable also identifying as transhumanists), we see it as a highly positive development that the majority of delegates for the Libertarian Party of California were sufficiently enlightened and foresighted to endorse Mr. Istvan, despite his apparent differences from some of the more orthodox or doctrinaire Libertarian Party positions, in recognition that both the growing role of technology and the recent political turbulence necessitate major realignments in order to pursue constructive solutions to contemporary predicaments. Some of Mr. Istvan’s Platform differs from that of the U.S. Transhumanist Party as well, but there are enough similarities to clearly indicate that he is closer to our adopted positions than any other candidate running on the California gubernatorial ballot – and we are pleased that he raises issues about the pivotal role of technology in solving contemporary political problems – a role that is all too often overlooked by “mainstream” or established politicians. Unfortunately, California has a “top two” electoral system, such that all candidates except the highest two vote recipients are unable to proceed beyond the primary. Nonetheless, having an openly self-identifying transhumanist appear on the ballot at all is still a victory and a step forward for the broader transhumanist movement. The United States Transhumanist Party acknowledges this development and expresses appreciation to Zoltan Istvan for a determined and effective campaign. Whatever happens at the ballot box in California on Tuesday, June 5, 2018, we continue to welcome Zoltan Istvan as our Political and Media Advisor (a non-leadership role, but one in which he has provided valuable insights), and we expect that he will continue to be prominent and successful in his future personal endeavors. Note: This statement was issued without any involvement by Zoltan Istvan and is entirely a gesture of good will by Chairman Gennady Stolyarov II of the United States Transhumanist Party.